President Barack Obama meets with Israeli Prime Minister Benjamin Netanyahu in the Oval Office of the White House in Washington, Monday, Nov. 9, 2015. President Barack Obama and Israeli Prime Minister Benjamin Netanyahu on Monday insisted they had not given up on the pursuit of Middle East peace, even as the prospect of an elusive agreement between Israelis and Palestinians appears further out of reach. Obama and Netanyahu's meeting at the White House marked the first time the two leaders have talked face to face in more than a year. Their relationship has long been marred by tension, with the most recent being the U.S.-backed nuclear deal with Iran. Ahead of Netanyahu's arrival in Washington, U.S. officials made clear the White House does not expect peace to be achieved before Obama leaves office in January 2017. Speaking to reporters ahead of their private meeting in the Oval Office, Obama said he would instead seek Netanyahu's thoughts on ways to lower tensions between Israelis and Palestinians and get the parties "back on a path towards peace." Netanyahu declared, "We have not given up our hope for peace." He emphasized that his preference was for a two-state solution, but gave no ground on the Israelis' long-standing conditions for achieving that outcome. Monday's meeting comes amid a fresh burst of violence between Israelis and Palestinians. Israel has accused Palestinian political and religious leaders of inciting the violence, while Palestinians say the violence is due to a lack of hope for gaining independence after years of failed peace efforts. Earlier Monday, Israeli Cabinet Minister Silvan Shalom, Netanyahu's designated negotiator with the Palestinians, said the prime minister would outline for Obama a number of confidence-building gestures toward the Palestinians, including easing restrictions on communications, water usage, work permits in Israel and Palestinian development in the West Bank. Even with no chance of significant progress on Mideast peace, the fact that Obama and Netanyahu met at all is seen as an important step. Tensions between the long-time allies boiled over earlier this year as Obama and international partners finalized the Iranian nuclear accord, a high-stakes agreement Netanyahu furiously tried to stop, even delivering a speech to Congress to urge lawmakers to block its implementation. The leaders largely sidestepped the Iran nuclear issue in their public comments. Obama called his differences with Netanyahu on the Iran deal "narrow" and the Israeli leader didn't mention the matter at all. Obama and Netanyahu also planned to discuss progress on a new security agreement that could result in increased U.S. military assistance to Israel. U.S. officials said that while they did not expect Monday's talks to result in a final agreement, it was significant that the leaders planned to discuss the matter given that Netanyahu had refused to do so in the immediate aftermath of the nuclear agreement. 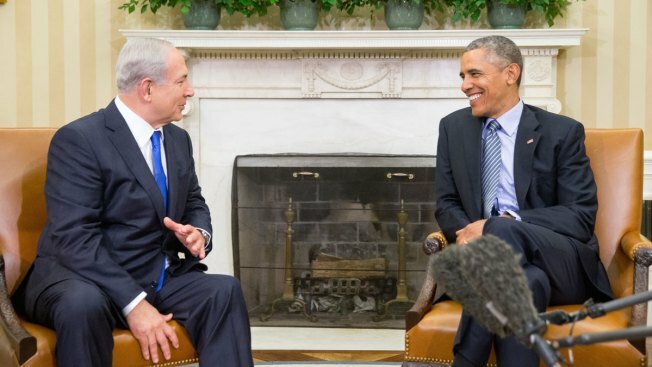 "The security of Israel is one of my top foreign policy priorities," Obama said. Monday's meeting was clouded by the controversy following Netanyahu's appointment of a new spokesman who has spoken derisively about Obama. Ran Baratz, a conservative commentator, has suggested in Facebook posts that Obama is anti-Semitic and Secretary of State John Kerry cannot be taken seriously. U.S. officials said they did not expect Obama to bring the matter up in his private discussions with Netanyahu. White House officials, including Vice President Joe Biden, have expressed displeasure over the appointment. Baratz is not on the trip, and Netanyahu has said he will decide his fate after returning to Israel.